(Larkspur, CA) – H3R Performance has added four new 5 lb. models to its popular line of dry chemical and “clean agent” fire extinguishers. The company’s MaxOut™ dry chemical offering now includes three 5 lb. extinguishers in red, black and chrome to go along with its 1, and 2.5 sizes in the same colors. The HalGuard™ “clean agent” line expands with the addition of a 5 lb. black model to complement the already popular red and chrome colors available in a variety of sizes. “We’ve enjoyed great success with the gloss black fire extinguishers introduced last year, and interest in our 5 lb. clean agent extinguishers is growing. By including a black option for our 5 lb. clean agent range, and adding a 5 lb. dry chemical extinguisher in three colors, we provide maximum choice to the automotive and heavy duty markets,” said Chris Dieter, senior vice president, H3R Performance, Inc.
HalGuard™ is a premium “clean agent” fire extinguisher that does not leave a messy residue making it the perfect product for protecting classic collector, high performance, tuner, and race cars. MaxOut™ is a dry chemical extinguisher that has a proven track record in smothering the types of fires that occur in an automotive environment. For more information on the H3R Performance line of premium UL Listed fire extinguishers and billet mounting accessories, phone 800-249-4289, or visitwww.h3rperformance.com. 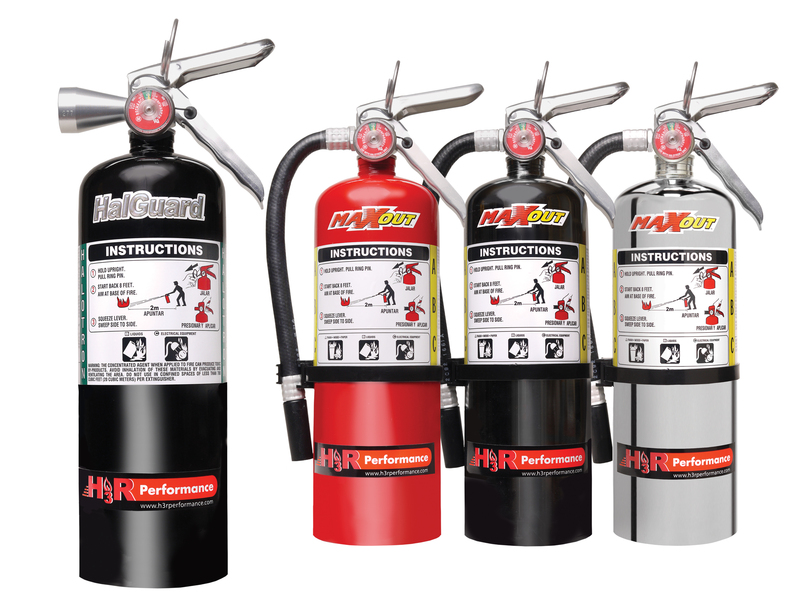 H3R Performance, Inc., a member of the H3R family of companies, offers the automotive aftermarket high quality, USA-made, UL Listed fire extinguishers under the HalGuard™ and MaxOut™ brands. HalGuard™ “clean agent” extinguishers do not leave a messy residue. MaxOut™ is a reliable line of dry chemical extinguishers. Both are effective on flammable liquid fires and do not conduct electricity – two important considerations when dealing with the types of fires most likely to occur in an automotive environment. HalGuard™ and MaxOut™ are available in a variety of sizes in rechargeable chrome-plated, red or the new black bottles. They sport high quality steel cylinders, all metal valve construction, and aviation-quality mounting brackets. The company also offers NHRA, IHRA, NMRA, NMCA and NSRA-accepted billet aluminum quick-release mounting brackets. The H3R group of companies includes: H3R Performance, H3R Aviation, the largest supplier of portable clean agent fire extinguishers to the aviation industry, and H3R Clean Agents, a major buyer, seller and recycler of clean agents to the fire protection and other industries.